As you must have noticed, iTunes will automatically launch itself whenever you connect your iPhone or iPad to your Windows Computer or Mac. This can be quite annoying, in case you are just trying to charge your device and have nothing to do with iTunes. In case you want to, you can easily stop iTunes from opening automatically, whenever you connect your iPhone or iPad to your computer for charging your device or for other tasks that have nothing to do with iTunes. Follow the steps below to Stop iTunes from automatically opening itself, whenever you connect your iOS device to your Windows Computer or Mac. Note: Clicking on the phone icon is required to reveal the iTunes Settings Menu in the Left pane (See image in step 5 below). Un-checking this option will prevent your iPhone from automatically syncing to iTunes and you will no longer see iTunes opening automatically, whenever you connect your iPhone to your Computer for charging. 2. You will see iTunes appearing as soon as you connect your iPhone to the Computer. 3. 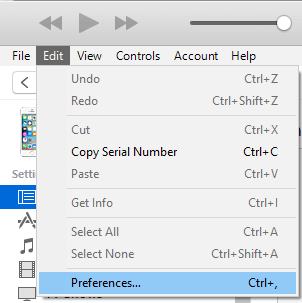 Next, click on Edit option in the iTunes upper menu (See image below). 5. 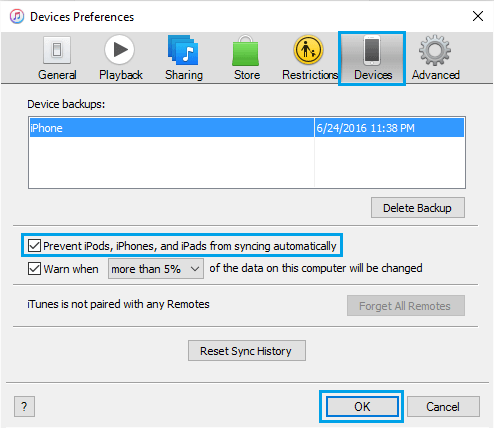 On the next window, make sure that you are on Devices tab and enable the option “Prevent iPods, iPhones, and iPads from syncing automatically” by clicking on the check box next to this option (See image below). As it is clear from the wordings of this option, enabling the option will prevent your iPhone or iPad from syncing automatically. This will ensure that iTunes will not open automatically on your Computer, whenever you connect your iPhone or iPad for charging and other non iTunes related tasks. In case you need to do something on iTunes, you can always launch iTunes by clicking on the iTunes shortcut on your Computer, instead of having iTunes opening automatically, whenever an iOS device is connected to your Computer.